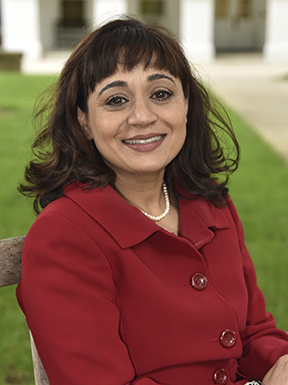 Pareena G. Lawrence became Hollins University’s 12th president on July 1, 2017. A proven leader and strategic thinker, she is devoted to the empowerment of women and the liberal arts. President Lawrence was born and raised in India. While growing up she attended an all-girls’ school, which she credits with changing her life and serving as a catalyst for her strong belief in the power of a woman’s college. Graduated with honors in economics from the University of Delhi in 1987; two years later, she moved to the United States to pursue her Ph.D. in economics at Purdue University. Joined the faculty at the University of Minnesota, Morris in 1994. She was presented the University of Minnesota, Morris Alumni Association Teaching Award in 2005, and the following year, she received the Horace T. Morse – University of Minnesota Alumni Association Award for Outstanding Contributions to Undergraduate Education. In 2008, she became a full professor of economics and management. Was appointed provost and chief academic officer at Augustana College, a nationally ranked liberal arts college in Illinois, in 2011. Her responsibilities went beyond the traditional role of provost: She oversaw an innovative set of student services, pioneered new career development initiatives, and was a successful fundraiser and external ambassador for the college. President Lawrence has studied extensively the role women play in international economic development. 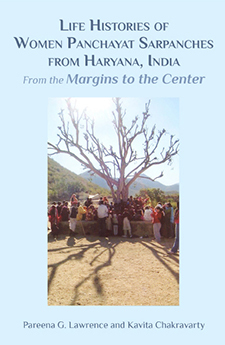 Her new book, Life Histories of Women Panchayat Sarpanches from Haryana, India, co-authored with Kavita Chakravarty, was published in Summer of 2017 by Cambridge Scholars Publishing. The volume features ten women who have been elected as village leaders and explores their motivations, the barriers they face, and the difference they are making. President Lawrence is married to Todd Lawrence, a financial advisor. They have two sons: Aaron, a college senior, and Josh, a college freshman. President Lawrence spoke about campus free speech in her keynote address at the Association of American Colleges and Universities conference luncheon for faculty and administrators of color on January 25. President Lawrence discusses her first seven months in office.